David rescued a truckload of ¾” boards from the burn pile at work. 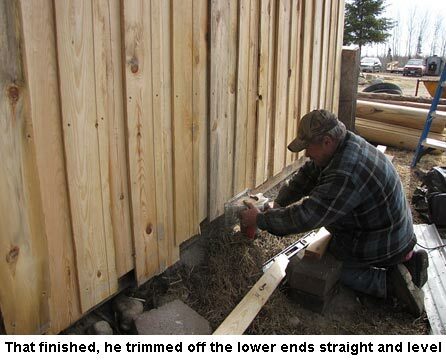 They were cuts off of full length cants prior to being run through the mill to make round logs for building log homes. We didn’t exactly know what we’d do with them, but then we got an idea — siding! Will began nailing them up on our storage barn wall, closest to the house, in board and batten fashion, only using a whole board for battens. Nearly running out of boards, he squeaked by at the final corner. Whew! Then he snapped a chalkline down the bottoms, which were uneven and cut them off with the circular saw. Then he, Ashley, and I started giving it a good coat of semi-transparent dark stain to match our house. Will did the ladder work and Ashley and I traded holding up the can for him and painting the stain on the lower parts. It looks great. We spent the weekend picking up, raking, and cleaning around the yard. There’s still more to go, but we’re getting there. I saw a killdeer, a woodcock, and several pine siskins this weekend. We also heard the first wood frogs starting to sing in our beaver pond. But this morning, there was ice on the birdbath and goat water. Our wild turkey hen has gone off to sit on a nest; she wasn’t in the orchard yesterday or today. We sure wish she’d bring her babies home instead of taking them off in the woods. But, hey, she’s a “wild” turkey — It’s what they do. 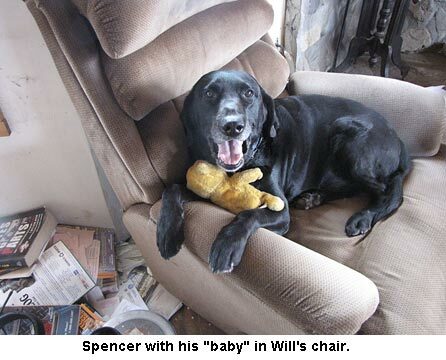 We got in from chores this morning and found Spencer lying in Will’s chair with one of his “babies” (stuffed animals). He sure loves them. Sometimes he lays on his back and tosses the baby up in the air with his front feet and catches it in his mouth with a happy smile. How many dogs play catch by themselves? Yep, Spencer is doing great and LOVES his babies. He lays on the floor with a baby in his front paws and throws it up in the air so he can catch it. Pretty smart dog; he plays catch by himself! Things are looking so good at your house! Happy Easter! Our oldest black lab (17 yrs old and counting!) has always done this as well – :-) they are such sweet dogs!! 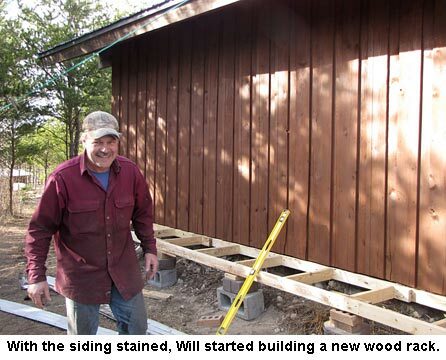 The siding looks awesome – congrats on that score and great use of materials. So much inspiration reading your blog!! So glad Spencer is doing well; I know he is getting up there. He definitely looks happy with his baby! Nice job on the siding as well! How beautiful! That should extend the life of the shed wall by many years. 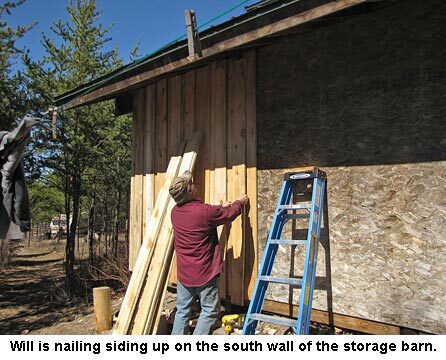 I have read that barns were sided with board and batten siding because the vertical boards shed water much better than horizontal boards, and common people often didn’t have finances to paint BOTH their house AND their barns. Doesn’t God just bless us with some of the greatest blessings, if we just keep watching for them! Fantastic work on the siding and rack! Hard work and creativity go far. Spencer is such a sweetheart. You guys are amazing!!! And that boy with his toy..cute, cute. Looks pretty happy. Of course, so does Will. Nice when a plan comes together.